In the past week and a half, I have been approached by three separate women about the exact same topic: my daughter’s hair. I have a three-year-old little girl. And, apparently, three is the age when little girls should start getting their hair “done”, meaning fashioned into some type of ornate style. Furthermore, I do not understand when or how it became acceptable to approach a parent (generally a mom) and tell her she needs to “do” her daughter’s hair. For the record, most people probably don’t this to other parents. But if you’re the kind of person who does, here’s a newsflash: My daughter’s hair is NONE of your business. 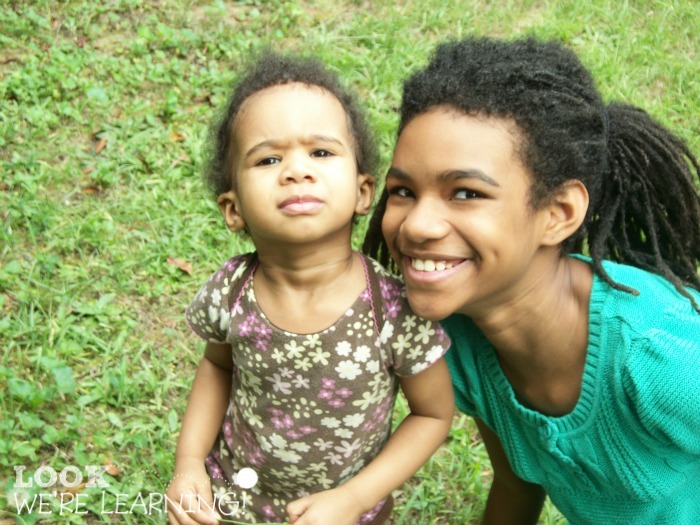 My three-year-old daughter, my 11-year-old daughter, and I all wear our hair in its natural state. We don’t use any types of relaxers, lye products, flat irons, or anything that changes the texture of our hair. It’s not that I think these things are bad or wrong somehow. We just choose not to use them. This means that our hair rarely ever looks “neat”. But it’s always clean, moisturized, and detangled. The hairstyle that I painstakingly created lasted a total of 14 minutes (give or take) before it began to devolve into a frizzy mess. Afterward, I realized: It’s just not worth it to “do” her hair at this age. At least not for me. Honestly, we’re talking about a three-year-old child here. I guarantee you that having her hair done is verrry low on her list of priorities. And I pretty much took the same approach with my tween until she decided she wanted to do something in particular with her hair. You know what IS worth it at this age? And I will not apologize for refusing to think of getting their hair “done” as anywhere close to a priority in their lives. I want to raise happy, confident young women who love living, no matter what kind of hair they were born with. And I think my husband and I are on the right track. So if you want to give me a box of barrettes, a card for a local salon, or ask me why I don’t “do” their hair, expect me to respond by telling you that my daughter’s hair is none of your business. Have you ever had someone imply that you should do “more” with your daughter’s hair? Did you feel bad or guilty? Did you get angry? I’d love to hear your experiences in the comments! 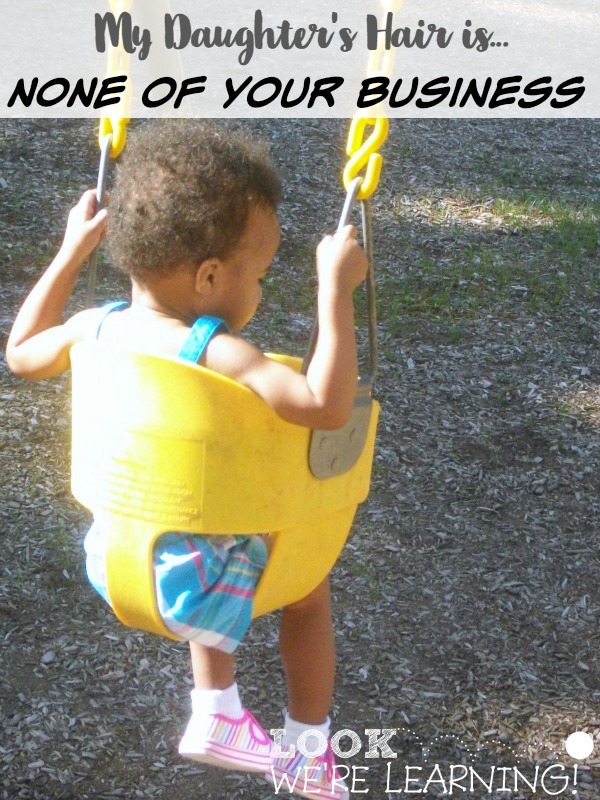 For more posts about parenting, follow my Parenting with Joy board on Pinterest! This was a wonderful post, and you and your girls are absolutely beautiful! As a white momma raising two black sons, I get approached about hair a lot. And I get that–I certainly didn’t know what a was doing right at first. But I put a huge of effort into learning how to moisturize and untangle! My 6 year old is very active and prefers a short cut so he doesn’t have to have it “done” all the time, but my 1 1/2 year old has longer curls that are wider and very fine. His hair frizzes no matter how much time and product I put in it, and that’s all there is to it! I was self-conscious about this at first, but then I realized that it was more important not to force him to sit in the chair for forever just to look like someone’s else’s standard of good hair. So now I can shrug off the comments with a little more confidence–especially when I read things like this post! I think it’s wonderful that you are going the natural route with their hair. It’s so beautiful and makes such an important statement to them. 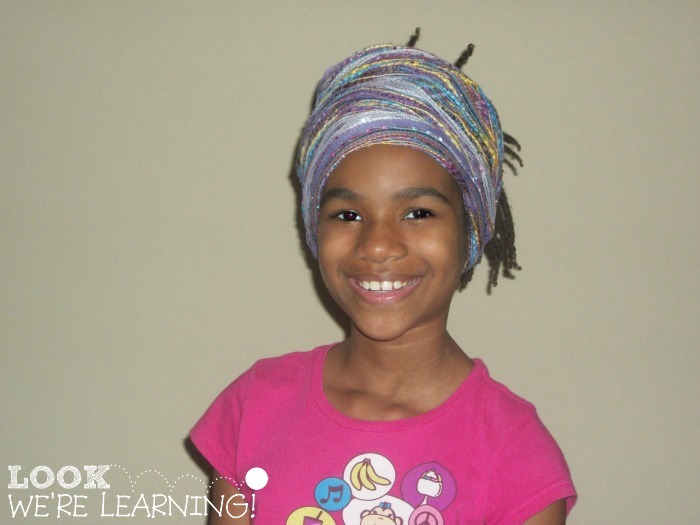 PS – Love your older daughter’s head wrap! Thank you for your post. Similar to you, my children and I wear our natural hair by choice but we have the opposite problem. My son has a huge afro and people think it is okay to touch it without permission which makes me (and him) very upset. I love your message to your girls and it is one I teach to my own children. Overall, I just ignore the ignorance but will speak up when folks either touch or say something. I personally love your approach! I’m always surprised by some of the things random strangers will come up and say to parents about their children. No, I don’t need your advice, person I’ve never met. My daughter has wildly curly hair that always looks “messy” too, but, like you, until she wants to do something with it, my job is to keep it clean and detangled and not change it into something it’s not. Thanks for sharing at the Thoughtful Spot! 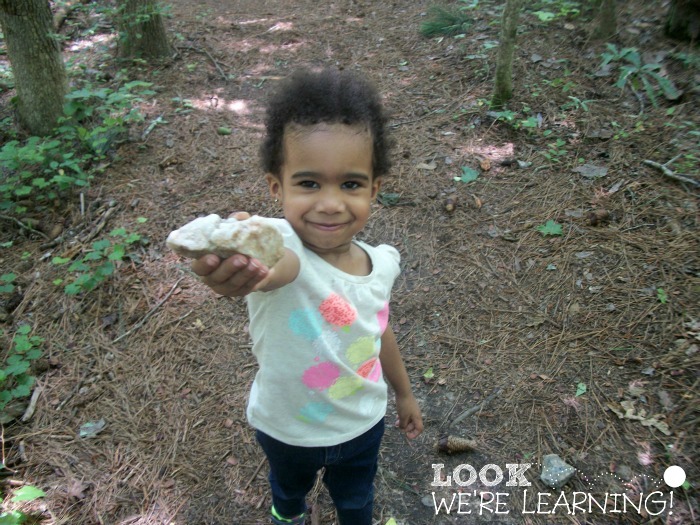 I have a 2 year old with pretty long blond hair… guess what? I am not messing with doing it! Life is too short for all of that drama! To pull it back out of her face I have to run along side of her trying to gather it into a pony tail. It takes 10 minutes or so normally for a 10 second task. No sooner than her hair is pulled back she is pulling the hair tie out. I am always amazed by people that have the TIME to worry about something like a kids hairstyle! Thank you! Who even wants to care about someone else’s child’s hair like that? We have a transgender child. In the weeks leading up to him telling us this when he was 8, he asked for a harry potter haircut. I found it really hard but we did it because it was ‘her’ hair. We had so many negative comments. I tried ignoring it, until I got fed up and I started saying, and posted to fb, ‘it is hair, it will grow back. I have short hair and so do some of you adults. It is her body to do with as she chooses. As her parents we do not own it, neither does anyone else. She looks amazing, you can really see her face and it brings out her eyes, did you notice that? When her brother had long hair he got loads of compliments. Step up and validate her choice or step back and respect it.’ It worked, even though it was quite confrontational and when he came out to us as a boy, we very carefully let people know before they got anywhere near him. Not a road we have chosen but we got this. I think you are doing an awesome job of letting you children be themselves. I have had to defend my daughter since she came into the world. She doesn’t like dresses or earrings. When she was younger I got grief because I didn’t make her wear barrettes. She didn’t like them but she would wear them occasionally if I asked her too. Same with dresses and earrings. I think it is sad that I constantly have to do this. No one should have to defend their child so often or at all. And especially not about something as unimportant as a hairdo. This is so minuscule on the scale of “things that matter” it’s ridiculous. I personally hate seeing little girl made to look like grown up Barbies. Life is not perfect and they need to explore and be able to enjoy their childhood. My daughter has hair bows, and likes to wear them for about 5 minutes. Then it’s time for me to pick them up wherever she threw them. You are doing a great job raising beautiful daughters! Good for you!!! And I completely agree. Yes! They’re tiny little people. There will be plenty of time for them to get self-conscious about their hair later in life. Now is the time to be a kid. Your girls hair is lovely. I’ve had people say to me to cut my boys hair because only girls have long type hair styles. He has the hair he was born with and it’s got some lovely curls to it. The reasons for this is wont sit still long enough for any one to do anything apart from taking the ends of. Also because I don’t want him to conform to needing his hair kept short just because his a boy. When his older and can ask for a style then I will consider it. I absolutely love this post! It encourages me in so many ways. My daughter’s hair is none of your business. My decision to homeschool is none of your business. I could go on and on. Jehovah certainly knows just what we need at just the right time.